Spotlight Search may be the most underused feature on the iPad or iPhone. Instead of hunting through page after page of apps, you can use the iPad's search feature to find the app for you. Because the search results update with each letter you type, you may only have to tap a few letters to bring the app to the top of the screen. Spotlight Search is about more than just launching apps, though. It searches your entire iOS device including your movie collection, music, contacts, and email. 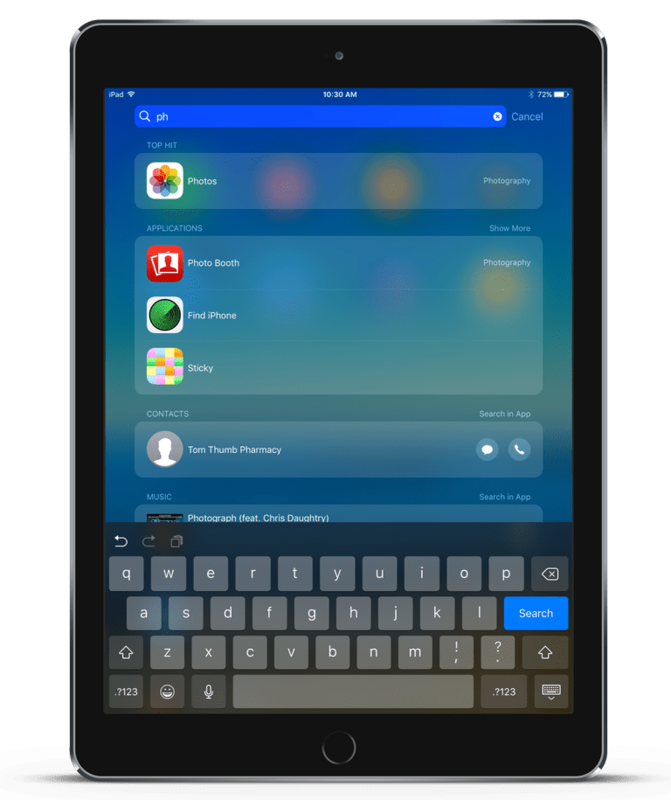 Spotlight Search also searches outside your iPad. It brings in results from the web and the App Store, so if you are searching for an app that you deleted, it shows the App Store listing for that app. If you are hungry, you can type "Chinese" to bring up nearby Chinese restaurants. Spotlight Search can also bring up information from Wikipedia and search results from Google. To open Spotlight Search, you must be on the Home screen, not in an app. The Home screen is the screen full of app icons used to launch apps. If you have an app launched, you can get to the Home screen by clicking the Home button below your iPad screen or by flicking up from the bottom of the screen on iOS devices that don't have a physical Home button. Spotlight Search is revealed when you swipe from left to right with your finger on the first page of the Home screen. If you run iOS 9 or earlier, swipe from the top down to open the search screen. The Spotlight Search screen that you see has a search bar at the top. It may also have other contents until you use it for a search, such as Siri App Suggestions, Weather, Calendar events and many other options, all of which can be activated or deactivated in Settings > Siri & Search. Open the Spotlight Search screen and start typing the app's name in the search field. The app icon appears on the screen. Just tap it. It's much faster than hunting through screen after screen. When you Spotlight Search a TV show, the results show you which episodes are available on Netflix, Hulu, or iTunes. You'll also find cast lists, games, websites, and other results related to the specific show you choose. If you have a large music collection, Spotlight Search can be your best friend. Instead of opening the music app and scrolling through a lengthy list for a particular song or artist, open Spotlight Search and start typing in the name of the song or band. The search results quickly narrow, and tapping the name launches the song in the Music app. The ability to search nearby locations isn't limited to just restaurants. If you type gas, in the search field, you get a list of nearby gas stations with distance and driving directions. You can search for anything on your iPad including movies, contacts, and email messages. Spotlight Search can also search inside apps, so you might see results from recipe app or a phrase saved in Notes or the Pages word processor. Open Apps on Your iPhone/iPad Even If You Don't Know Where they Are!